In the modern world, women are consistently second choice to men in just about everything – mostly for sexist reasons. They also make less money for doing the exact same job – also for sexist reasons. But it’s not only today this happens, because it’s been that way since time immemorial, and Hollywood has certainly been no different: all the big stars are men, and all the big paydays are for me. For proof, consider the relative pay imbalance between Mark Wahlberg and Michelle Williams for Ridley Scott’s All The Money In The World, even before Wahlberg squeezed more money out of the re-shoots. It is in light of all this that the achievements of Frances Marion were all-the-more amazing. Marion came to film after working as a commercial artist and in the newspaper business. She made the transition into film in various lower-level jobs, before finally adding screenwriting to her resume. By the 1930s she was probably the most in-demand screenwriter in Hollywood, and also the highest paid, making $50,000.00 per year. So, she was in demand, made good money, and was also the first woman to win two Oscars – the first woman to win two Oscars, and the first person to win two for writing: she won for writing The Big House, and for The Champ. Yet, despite her accomplishments, she is not remembered the same today as other writers might have been. When people talk about the great screenwriters in history they surely include Robert Towne, Paddy Chayefsky and Billy Wilder, but never mention Marion. Is it because she was a woman? Or was it she wrote movies in a completely different era? Whatever the answer, the telling thing is she was forgotten. The Champ (Beery) is down on his luck, living in Mexico with his son, Dink (Cooper). They are poor, the Champ is pretty ne’er-do-well, and every time he does something good for the kid, he follows it up with failure. But, Dink is still devoted to his dad, to the extent that when Dink’s wealthy mother shows up to try and claim the boy, the kid won’t go. Fortunately, the Champ manages to line up a fight that will net his a good payday, and despite being out of shape, and having a bad heart, he manages to win. Only…right after he wins he drops dead right in front of the kid’s eyes. Wallace Beery won the Oscar for Best Actor for his role in The Champ despite not actually winning. In the early 1930’s the Academy did two things of importance: (1) they released the vote totals of the Oscar race, and, (2) they considered close races a tie – those within a vote were official ties. 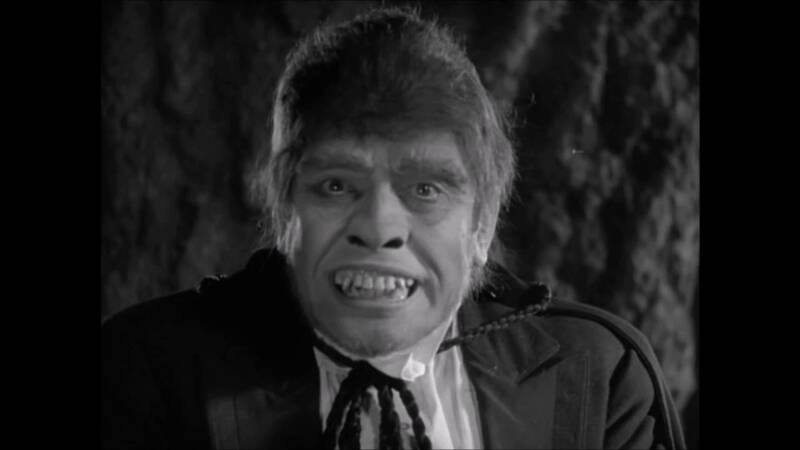 Which is how we know Beery actually finished a vote behind Frederick March for his role in Dr. Jekyll and Mr. Hyde, and still managed to win the Oscar, despite losing. Given the way our electoral system works, losing and winning this way almost makes sense. Nevertheless, the Academy would later change this rule, meaning all later ties, including Best Actress 1968, were actual ties. They also stopped releasing vote totals. The question, though, is whether Beery was worthy of the Oscar, because the plain fact is Beery is a broad actor – he’s good at comedy, but really, he’s more a presence than anything else. Given his look and his manner, it’d be easy to dismiss his performance as just the product of right place/right time. But to dismiss it this way, shortchanges Beery. Yes, he’s goofy and coasts off his presence, but there are times in the movie where you see the real flashes of his ability. For instance, when he tries to send the kid away to live with his mom, it is clear the champ is struggling against doing what he knows is best for the kid, because it goes against his own wants. His work in the scene is honest, and there is real emotion in his eyes. To be fair, he doesn’t have many of these moments in the film – he’s not an actor to play tortured – but there’s enough here to say the award wasn’t unearned, even if it’s doubtful he’d ever win today. But lets be honest, while Beery shows flashes of drama and real pathos, part of the Best Actor Oscar should have gone to Jackie Cooper, who played the kid. After all, if the chemistry between these two weren’t rock-solid, the film would be insufferable. But because they seem like they are actual family, and have real affection for one another, it helps justify Beery’s win. It might be the first and only time where an acting Oscar should have gone to two actors in the same movie, because without the performance of the one, you don’t have the performance of the other. That all said, for this entry in The Also-Rans Project I managed to catch up with the Frederic March version of Dr. Jekyl and Mr. Hyde so I could compare the performances of the two men who were actual co-winners. Of the two, Beery’s work in The Champ is the most natural. He’s the one who doesn’t entirely look like he’s acting, which might be because he’s not acting, and just being himself – that’s what stars do, right? – or it could be that he’s giving the best performance of all, because you can’t even tell he’s performing. On the other hand, March’s performances as Jekyll and Hyde are the most performative, the most theatrical. As Jekyll, he has scenes of important pontification, in which he expounds upon grand subjects. As Hyde he’s much more physical – though still verbal – and behaves as if he is the id unleashed. In the Jekyll half of his performance, March is good, but it’s obviously performative. It’s self-serious and earnest, is a chewing-the-scenery type performance in its own way, and is obviously acting with a Capital-A. Curiously, while the Hyde portion of his performance is also obviously performative – he’s got these giant tooth inserts that he keeps sucking his lips over, drawing obvious attention to the fact that he’s in makeup and prosthetics – it’s also the time when March seems most natural. Where the Jekyll parts seem like a put-on, the Hyde parts seem closet to pure, disappear-into-the-role acting. Of the two, it’s hard to say who should win, because both men give flawed performances. In the end, it might be enough to say that because neither stands above the other, it’s fair they both won an Oscar. Did They Really Fight Like that? The Champ climaxes with Beery boxing a Mexican champ, which looks less like a professional fight than the silly brawling of two amateurs. They are neither compact in their bodies, nor do they keep their arms from flailing wildly. At first I thought this might simply have been a difference of time period – that maybe boxing had changed so much in the last 80 years that what they thought was boxing then looks like a different sport altogether to us today. To get to the bottom of it I watched highlights of 1930’s matches on Youtube and while it’s definitely clear boxers preferred a different stance and approach at that time, there was still compactness to their movement, especially with their punches. Where Beery flails and throws punches in a round side-to-side motion, the professionals keep their elbows in and throw punches more back-to-front. I guess it would only be later the film industry got wise to using a fight coordinator to get to some verisimilitude into these sorts of films. These days, if a movie is shot and released within one year, that’s considered a big deal. When it happened this year for The Post, which began filming on May 30, 2017 and was in theaters on December 14, 2017 – or a little more than six months from beginning to end – it was a big enough deal to be mentioned at the time of release. But while this was an expedited schedule by today’s standards, it was straight-up indulgent by the standards of the early days of film. 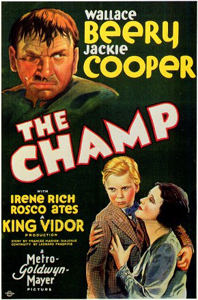 After all, The Champ apparently began production in mid-August 1931, was finished filming a little more than 8 weeks later, in mid-October 1931. Just three weeks later, on November 9, 1931, it was in theaters. I guess back then they just didn’t see the point in waiting to try and get their money back on a film. Best Picture 1931/1932 was Grand Hotel, a movie I know lots of people are high on, but I’m only so-so. Moreover, it took three different tries for me to get through it, and the only reason I did on the third try is I was reviewing it for The Best Picture Project. In the end, the Joan Crawford parts are decent, but the rest does little for me. Still, I’m not any higher on The Champ. Yes, it’s barely 90 minutes long, but it’s a meandering and shaggy 90 minutes, and is only saved by the magnificent chemistry of Beery and Cooper. In the end, it’s that chemistry which edges The Champ out in front of Grand Hotel for me, even if neither of them are films that demand a re-watch. This is the equivalent of $720k today, which doesn’t seem like all that much. Bear in mind, though, that salaries in the studio system for writers were not the same as today, when folks are free agents and compete in the open market. Also rememebr that money has a different meaning in Hollywood and does not track inflationarily the same as money in the real world. For example, the highest paid actor in 1937 was Gary Cooper (http://stuffnobodycaresabout.com/2014/08/30/salaries-hollywood-1937/) at $370,214.00, which translates to $5,306,199.78 today. For comparison’s sake, run-of-the-mill Hollywood star, Mark Wahlberg, made $12,000,000.00 for co-starring in All The Money In The World. The first two-time Oscar winner was director Lewis Milestone, who won Best Director twice – for comedy direction in 1927/28, the only year of the award, and for regular direction in 1929/30. Interestingly, at the same ceremony where Marion won her second Oscar, director Frank Borzage got his second Oscar, having previously won in 1927/1928 as Best Director of a drama. Thanks to TCM and their 31 Days of Oscar for that. Which is the whole point of the story of Jekyll and Hyde. Obviously, this does not include any pre-production time, or scripting. On it’s own, this turnaround time is insane. It’s even more insane when you remember they actually had to deal with physical film in those days, both in terms of cutting the film and assembling the movie, then striking prints to actually show in theaters.